The number of New Zealanders aged 65 and over is predicted to almost double in the next 10 years. More than ever, these older workers are now staying within the workforce, either by choice or out of necessity. At the same time, the first of a new generation – dubbed “Gen Z” – are just beginning to reach employment age. We are now in an unprecedented time where we have four generations in the workforce simultaneously, and addressing and managing the potential conflicts and benefits that arise from a multigenerational workforce is becoming a major focus for organisations. But what are these conflicts and benefits? 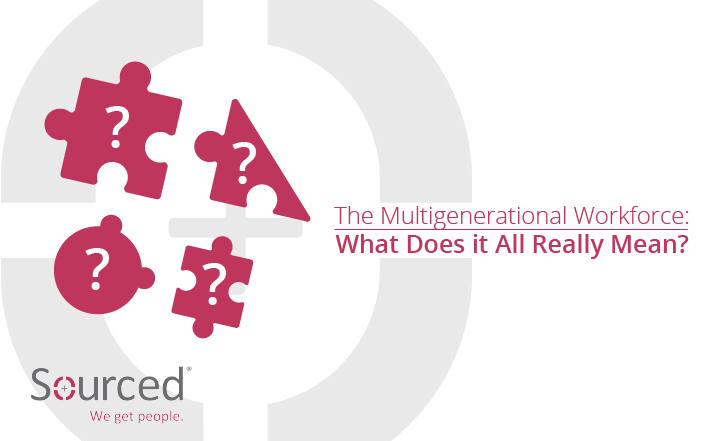 Does having a multigenerational workforce really change anything? Essentially, the debate is about focusing on the past (your veteran presence who have perhaps taken a step back in the business), present (your current leaders and key contributors) and future (the bright sparks in junior positions who you’ve earmarked for future success) of your organisation. However, does choosing between them really need to be an option? Though the emergence of this multigenerational workforce has created much in the way of workplace trend hyperbole, nothing much has really changed. Though it may not have been so pronounced previously, there have always been people of different ages within organisations. The key is that each person within those generational groups is different, and can’t all be compared under a catch-all term like “Gen-X” or “Millennial” that handily sums up their motivations, skills and preferences. Age is just one changing aspect of workplace that’s becoming more diverse across the board. In reality, you can’t manage a generation in the workplace, so ensuring that you’re communicating effectively with individuals and providing them with the resources and environment to thrive is crucial. As our workplace becomes more diverse, leaders need to break free from old, rigid leadership models and embrace greater flexibility so they can better understand each individual in the workplace. In turn, this will allow them to unleash their potential and encourage a better environment for employees to collaborate in. In practice, this means carefully considering each employee’s traits, including their strengths and weaknesses. For example, although Millennials might be seen as the “tech savvy generation,” doesn’t make it a blanket rule. If you have a Baby Boomer employee who is tech-savvy and a quicker learner, then you may well want to buck the trend have them be the first to test a new system or technology. Similarly, if a Millennial is showing more in the way of leadership potential than a Gen-Xer, then you may want to give them more responsibility within the team over other, older employees. Across your organisation, from business practices to performance reviews, tweak your approach to cater to the wants and needs of the individual, regardless of which generational group they belong to. Though it may read like pandering, it’s far less condescending than treating “Millennials” differently from “Baby Boomers.” Really it’s just common sense: do your best to make an employee feel comfortable and that will probably be reflected in their performance. Beyond the panic and bluster, your multigenerational workforce is much the same as any other workforce you’ve ever had. At the end of the day, if you promote an environment where everyone feels comfortable enough to bring their own views and ideas to the table whilst feeling respected, you’ll have a healthy and successful internal culture; no matter how many Gen-X-Y-Zers you might employ. Don’t forget to check out our blog for more recruitment and job searching advice, and our LinkedIn for the latest industry trends and insights.